Not even the police could protect the vile Westboro Baptist cult members protesting in Moore, OK, the site of a terrible tornado that killed many, including school children. The Westboro Baptist moonbats contend that God sent that tornado as retribution against Moore. UNREAL. The Westboro cult had a permit to picket for half an hour; however, outraged and sickened Moore residents put an end to that in short notice. The hideous protest lasted a mere eight minutes when several people took matters into their own hands and confronted evil with their own freedom of speech. This is what happens when ‘We the People” stand up and take back their country. America, learn from it! Hundreds of Moore residents lined Broadway across from Central Junior High Sunday afternoon. They were ready and waiting for members of the notorious Westboro Baptist Church. Members of that church have long contended that God hates homosexuality and America’s tolerance of homosexuality. They also claim that he sends disasters as punishment. Church members had a permit to picket in front of the school, which has been housing Plaza Towers Elementary students since last year’s deadly tornado. According to the Westboro website, they contend that God sent that tornado as retribution against Moore. KOCO: Counter protesters push Westboro Baptist Church members out of Moore. How does one battle and confuse those that are so filled with hate, why with kindness of course. 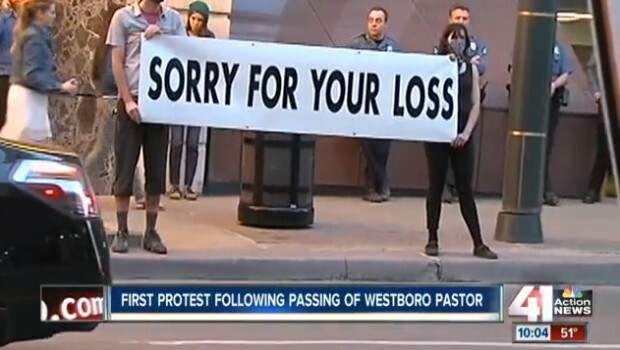 As Members of the Westboro Baptist Church were protesting with their anti-gay, anti-solider signs, outside the Midland Theater in Kansas City, MO of the pop singer Lorde’s concert, an interesting things happened … the counter protest was with kindness, not more hate. 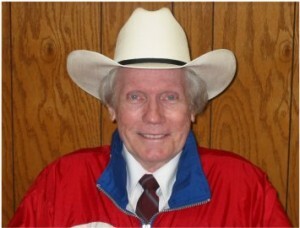 Earlier this week, pastor and founder of the WBC Fred Phelps died from natural causes. However, the message of kindness was lost on some of the clueless members of the WBC. Steve Drain, a long time Westboro Baptists Church member said in response to the sign, “I don’t even know what they mean by what they are saying.” Really? I guess when one is so consumed with ignorant hate, one has no place for compassion. Doesn’t this speak volumes of the evil message that these people have been brainwashed with. Good riddance to bad rubbish … Hell has a new occupant. Westboro Baptist Church founder Rev. Fred Phelps Sr. has died at age 84. The founder of the controversial church died of natural causes at 11:15 p.m. Wednesday, according to church spokesman Steve Drain Satan. Phelps and his misguided flock are known for their protesting of military funerals, preaching their “God Hates …” message. Sorry, but you do not have to be a member or even a supporter of the LGBT community to be against Phelps and the WBC. One only needs to have a clue and a sense of compassion. Never has a group of individuals been so misguided, under the guise of religion. Well, except Muslim jihadist extremists. Fred Phelps — the founding pastor of a Kansas church known for its virulently anti-gay protests at public events, including military funerals — has died, the church said Thursday. Oh the irony of ironies … according to his daughter, Margie Phelps, there will be no funeral for Fred Phelps. HA!!! What’s the matter, is the Westboro Baptist Church and the Phelps family afraid that a record number of people will show up to picket and protect his funeral, Hmm? Are they afraid that there will be signs by protesters stating, “GOD hates Fred”. Just curious? But this is the way that hypocritical hate works. It would appear that the iront was not lost on American Power either. Margie Phelps, Phleps daughter, told WIBW-AM that there will be no funeral for him. In a statement on his Facebook page, Nathan Phelps, who has been estranged from his father for 30 years, said the senior Phelps was dying in hospice care in Topeka, Kan., and that he had been ex-communicated from his own church in August of 2013. Kudos to Lefitists Holy Bullies and Headless Monsters … Rise above the hate. I’m sending this message to you in hopes that you may send it on. I hope that as in other times a cooler mind may win out before others make a choice we, the LGBT community, won’t be able to take back. It has been reported today that Fred Phelps has died. It is safe to say that, given his attitude and his devotion to hate, those of us within, and around, the LGBT community will not mourn his end. He caused many families pain at a time when they were already hurting from the death of loved ones. However, this is his legacy, not ours. As reported at Kansas First News, the founder of the hate-filled, judgmental church may be dead, but the ill-intended message continues. The WBC will continue to picket and spread their message of judgmental hate. Why would they stop, it is the only way they get attention. Some called his family the most hated in America, and there has been reaction worldwide about the death of that founder of the Westboro Baptist Church, Fred Phelps. According to Tim Phelps, one of Fred Phelps Sr.’s sons, Phelps passed away Wednesday night. With the news of his passing, there is a question people are asking: Will the picketing stop? It was business as usual for the members of the Westboro Baptist Church, less than a day after their founder’s death. “So it’s no different today?” Kansas First News asked Westboro Baptist Church members. ”No different today. Duty is the same,” answered a member who was picketing on 17th and Gage in Topeka. Don’t worry, there is a special spot reserved for you in the 7th level of Hell … hmm, or is it the 8th? Fred Phelps Sr., the founder of the radical Westboro Baptist Church is reportedly near death. Phelps is 84. This so-called Kansas church has become infamous for its protests at military funerals and anti-gay sentiments, promoting “Gad Hates Fags”. From the WAPO, members of the Westboro church frequently protest at funerals of soldiers with signs containing messages like “Thank God for dead soldiers” and “Thank God for 9/11,” claiming the deaths are God’s punishment for American immorality and tolerance of homosexuality and abortion. I guess some one forgot to tell this group that God loves, he does not hate. According to his estranged son via Facebook, Nathan Phelps, Fred Phelps is now on the edge of death at Midland Hospice house in Topeka, Kansas.” Nathan Phelps also said, the elder Phelps was ex-communicated from his own church last year. A second son of the elder Phelps Sr., Nate Phelps, also has confirmed that his father had been voted out of church. The Rev. Fred Phelps Sr., who founded a Kansas church that’s widely known for its protests at military funerals and anti-gay sentiments, is in a care facility. Son of Fred Phelps Sr. says father voted out of church. The information is based on an email sent by the son, Nate Phelps, to a Topeka Capital-Journal reporter. Nate Phelps said his father is near death. “(Fred) is at Midland Hospice House where, as of yesterday (Friday), he is comfortable without the respiratory difficultly that he was having the day before and is unresponsive,” Nate Phelps wrote, quoting a message sent to him. After Fred Phelps Sr. was voted out of the church, he was moved to another house where he could be watched for fear of him hurting himself, then he “basically stopped eating and drinking,” Nate Phelps said in the email. For many years, Fred Phelps Sr. and his wife, Margie Marie Phelps, lived in an upper floor of the church. A Westboro Baptist Church spokesman declined to comment Sunday on whether a report that Pastor Fred Waldron Phelps Sr. has been excommunicated from the conservative church, known for its controversial anti-gay stance, that he founded in the 1950s. Sorry, but HATE is not a religion. Isn’t this guy going to be in for a surprise when he finds the Pearly Gates locked and a sign that says, sorry, take this elevator straight to Hell. Looks like the moonbats at the Westboro Baptist Church need more media attention. It would appear that the Westboro Baptist Church members are going to picket movie critic Roger Ebert’s funeral. Roger Ebert passed away last week after his battle with cancer. Sorry, but whether one agrees with the guy or does not, have an ounce of class. Picketing a funeral, really? I know, I know, if these folks would protest a child’s funeral or a US soldiers funeral, what’s picketing a Hollywood movie critic’s one. On March 25, Ebert did in fact tweet a link to a Salon post that features an excerpt from a book by Jeff Chu titled Does Jesus Really Love Me? : A Gay Christian’s Pilgrimage in Search of God in America. Chu, a gay man, spent a day at Westboro as part of his research. WOW, really? What do they say about those who live in glass houses and what did the Bible say about those that cast the first stone?